In the top row of the second balcony at the Opera House in Blackpool, England, Hannah Jowle paused to take everything in. The 21-year-old was wide-eyed and shocked at what she had experienced in her hometown over the three-day Lancashire Festival of Hope. A total of 9,000 people had packed into the Winter Gardens complex over three nights with hundreds making life-changing decisions for Christ. Franklin Graham, a worldwide evangelist, had come to the seaside tourist town near Manchester and Liverpool, despite stiff opposition from Blackpool activist groups. His mission, contrary to local media reports, was quite simple—to communicate the love of Jesus Christ. Clearly energized by all the new believers, Haskett was more optimistic about the future of the Church in Blackpool, Lancashire and even spreading to other parts of the United Kingdom. 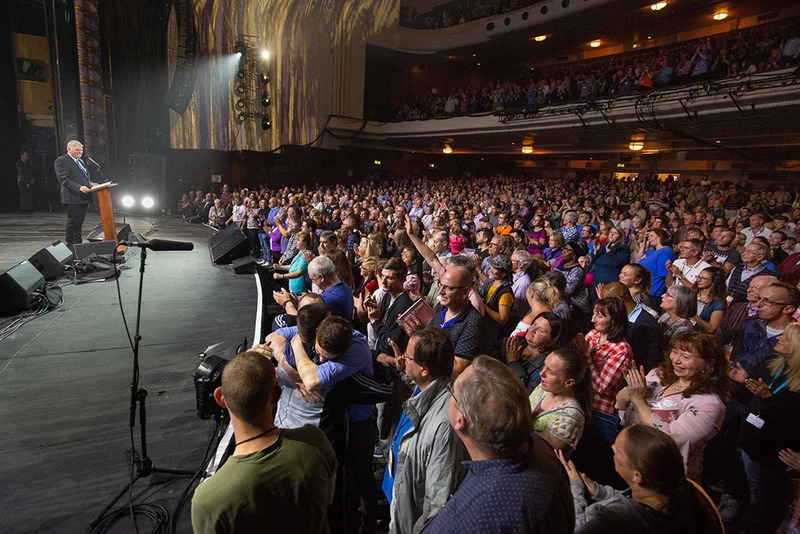 Sure, Michael W. Smith, Rend Collective, The Afters and Franklin Graham may have been the main draw for three nights, but it’s the hope of a changed England and revived believers that has churches steeped in anticipation. Just like the story of Bartimaeus (found in Mark 10), about a blind man who had basically lost all hope, resorting to begging for his next meal. “He’s just sitting there, hoping someone would drop in a coin or two,” Franklin said. “He doesn’t know Monday from Tuesday from Wednesday. Bartimaeus is hopeless. “But he’s heard the news of this man from Nazareth. He’s heard rumors that He’s made the lame walk.” So when Bartimaeus heard the commotion of Jesus making His way through the city, he called His name. Jesus stopped and gave him vision. So many people came forward, wanting to start anew with Christ, that the crowds swelled down the aisles. Filling the front were men, women and children. Among them was a 53-year-old woman from Manchester who had walked away from God after 11 years as a nun. There was a young woman, invited by her co-worker in Southport, who was pregnant and looking for a new start. One middle-aged man, who drove nine hours roundtrip from Somerset in the south of England, came because his dad was saved at a Billy Graham event in the ’80s. Outside of the 9,000 who came to Blackpool’s Winter Gardens complex, nearly 50,000 watched the three-day event online. “I don’t know the last time this many Christians worked together,” Haskett said. “Probably when Billy Graham came in the ’80s. Looking for the hope? Find the Good News of Jesus today.